Kitesurfing holidays? Where to? Not easy huh? Here is the most complete guide on the best kitesurfing spots in Mauritius. Kitesurfing season in Mauritius starts in April and easily goes all the way till the very end of November. This is the Mauritian winter with strong and consistent South-East trade winds blowing at about 15-25 knots. This is the best time to come if you're planning kitesurfing holidays in Mauritius. During the hottest months, December till about March, the strong winds drop off, leaving just a lighter, but still pretty consistent breeze coming from South-East. This breeze is noticeable pretty much all year round, mainly down South. The north parts of the island are more wind proof, protected by the mountains and so the winds tend to break and are usually not as strong as in the south parts. This is why the South of Mauritius offers the perfect kitesurfing conditions whole year through and the best kitespots on the Island, suitable pretty much for any skill level. There's a pretty good selection of "playgrounds" in the South from wide and shallow, flat lagoons and slightly wavy spots to some epic world class waves just a few hundred meters of the shore. 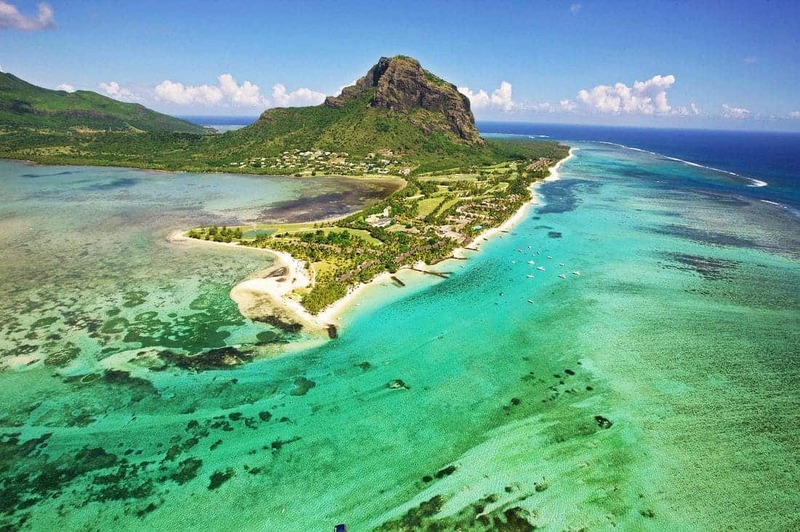 Without the doubt the most famous and cherished out of all Mauritius kitespots is Le Morne. This beautiful flat water lagoon offers a great spot for the beginners taking kitesurfing lessons, but also freestyle and freeriders. To complete that, there are a couple of well known kitespots with 1.5 to 3 meter tall waves, just outside the reef. The famous One Eye and Manawa. Click right here to check out much more detailed guide to the South part of Mautitius and the kitespots Le Morne, One Eye and Manawa. Moving East, the road will take you to Bel Ombre and further East Pointe d'Esny. Bel Ombre is a peaceful lagoon that offers plenty of space and enjoyable small waves to ride on. The area just along the shore may have a bit gusty wind, so watch out when launching, but as soon as you get a little further away from the shore, the wind becomes pretty stable. Pointe d'Esny - also know as Paradise Beach. The locals know this spot as being one of the most beautiful stretch of white sand beach and the best preserved coral reef lagoon on the entire island. Pointe d'Esny beach is without the doubt a well hidden gem and surely takes a proud spot in our best secret kitespots top ten. The bummer is that the beach is effectively sealed off by a few luxurious private properties, so unless you happen to be staying in one of the beachfront resorts, the only way to get to this secret beach is either by water or by foot. You can either take a long beach walk all the way from Blue Bay, which is worth the hassle anyways or your other option would be to take this little, just about 150 metres long pathway that's just off the main Costal Road. This tiny pathway sits just in between a couple of the private houses and if you manage to find it, it will lead you to the Paradise beach. So if you enjoy geo-caching, there you're go, go find the treasure! If you happen to be here on a non-windy day, make sure to checkout the near by charming village of Mahebourg for an authentic historical Mauritian experience. East of the island offers a real natural beauty and some really peaceful spots and some magnificent kitesurfing spots to check out. Trou d'Eau Douce & Joyride - With the good South-East wind and perfect conditions, Trou d'Eau Douce is just an awesome fun. In fact the whole beachfront is perfectly kitable all the way from April to November. The lagoon is nice and wide with more space than you need, mostly shallow, crystal clear water. When the tides are too low, the rocks and coral may be sticking out, so just watch out for this. The beachfront is wide enough for launching pretty much anywhere, specially further east, closer to the reef. The actual 'Joyride' kitespot is way too far to access from Trou d'Eau Douce side of the beach. The best way to get there is to take a shuttle boat to the Ile-aux-Cerfs, the tiny island just a mile or two of the coats. Then take a walk to the most south-east facing beach and launch from here. It'll be an awesome upwinder before finally reaching 'Joyride', but the kitespot is totally worth it. You'll be awarded with the real treat. Hundreds of square meters of shallow and perfectly flat water lagoon along the reef barrier, you'll own it for the day. Awesome for speed riding, practising tricks and freestyle. Palmar - Palmar is basically just a few kilometres round the cost from Trou d'Eau Douce. Kitespot more known to the locals. All travellers mostly hang around Le Morne and not many people venture out to try something different, so Le Morne always get to bask in the glory. Palmar is a few kilometres long stretch of an awesome lagoon with water not too deep and pretty stable 45 degree onshore wind. There's a Palmar beach just on the lagoon, so launching shouldn't be an issue anywhere. Spot is a pretty good choice for the beginners. Belle Mare - If you get bored in Palmar, change the scene and take a downwinder just a few kilometres up North to Belle Mare. Same kinda setup. Poste Lafayette - this kitespot is again more known to the locals, but great for so many reasons. There is a large and wide beach area, so if you're taking kitesurfing lessons, this is a good spot with plenty of space for launching and practising. The wind is pretty stable here, generally onshore, no currents or any other bigger hazards, so this makes this kitespot pretty safe for the beginners. The beach forms a little bay and so even if you're not too confident going upwind, you can just easily land at any point and walk upwind again. This kitespot has a couple of spots where the water surface is nice n' flat, good for a few tricks and if you watch and follow the locals, you might even discover the hidden wavy spot. These are the 3 kitesurfing spots on the very top of the island. Liked by the locals, but pretty hard to ride for the guests. While Cap Malheureux offers an eye pleasing scenery and beautiful turquoise lagoon with perfectly smooth flat water, it is rather recommended only to experienced riders. The wind is obviously less consistent here than down South, but the lagoon is perfectly kitable in most wind conditions. So what are the cons of this kitespot? The lagoon may just be too shallow and rocky during low tides. There is not much space for launching and the bay hosts quite a few boats, so there are plenty of hazards in the way already out of the box. Ansa la Raie and Butte a l'Herbe are located just a few miles East from Cap Malhereux. Both a part of the same lagoon, they offer much better conditions, but beginners, specially those taking kitesurfing lessons, should still stay under a heavy watch of their instructors. Just like at Cap Malheureux, both of these kitespots should be avoided by the beginners during low tides as the lagoon becomes too shallow and the rocks are sticking out of the water. Other than that, it's a peaceful, uncrowded spot. Travelling further around the North coast will bring us down to Bain Boeuf and Trou Aux Biches. Majority of the kitespots located in the north part of the Island rely on winds coming from the North-West or South-West. This doesn't happen very often unfortunately. The kitespots in the upper part of the island are perfectly ridable with ok wind conditions, but they're not massively popular in general. Both Bain Boeuf and Trou Aux Biches are not an exception. Trou Aux Biches is quite a tough kitespot and not recommended to the beginners. The Mont Choisy lagoon area is the hotspot for the jet skis and speed boats and together with the swimmers, this could pose quite a few hazards. Bain Boeuf - just like Trou Aux Biches, this spot is only good on a good day with North-West or South-West wind. If you get lucky, you could catch some pretty good waves coming in and out of the reefs. The shore is a bit rocky, so are some parts of the lagoon and the water could be quite shallow, so just make sure you drag your self far enough from the shore. Other than that, it is a beautiful lagoon definitely worth checking out. If you get there on a non windy day, book your-self a SUP or a fishing trip. This area is a beautiful part of the island. Around December, the wind could be playing up. If the wind is blowing North or North-West, you could check out the two kitesurfing spots on West side of the island called Flic-en-Flac and La Preneuse. If the wind conditions are right, these are awesome starting points to take a downwinder to Le Morne. There are few kiteschools in the area offering the downwinders and to accompany you with a safety boat. So if you're not confident enough on your own, you should check out these options. If the wind conditions happen to be right and you're confident, do it, it'll be an awesome experience. As for riding in these waters, experience level is necessary and both spots are not exactly beginner friendly. Both kitespots belong to the Tamarin area and are not protected by the coral reef. If you go to far to the sea, you may end up in a pretty strong current that rules these waters. Both Flic-en-Flac and La Preneuse are public beaches in this area that attract both tourists and locals. Lots of swimmers, kiters, windsurfers and boats share the same space. Place gets crowded and could become a risky spot for all. So there you have it, the most complete guide to the best kitesurfing spots in Mauritius.